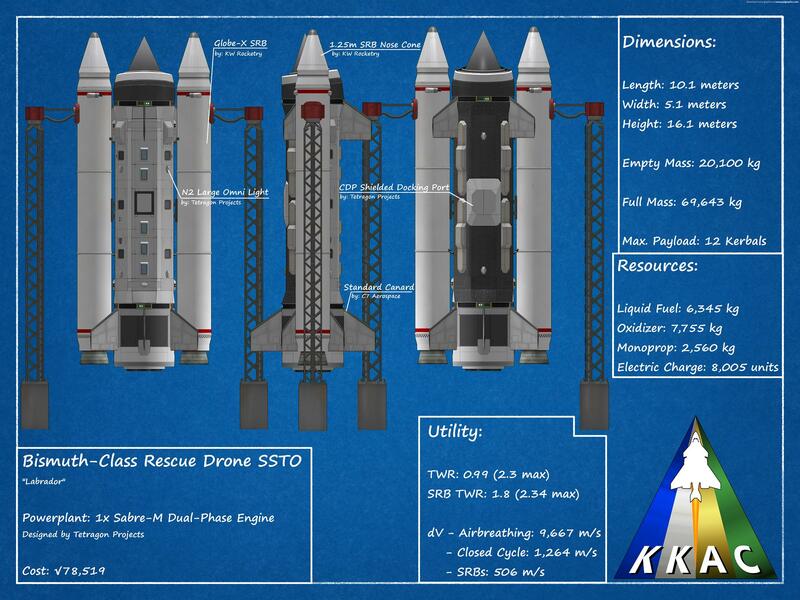 KerbalX - Bismuth-Class Rescue Drone SSTO: "Labrador"
Bismuth-Class Rescue Drone SSTO: "Labrador"
A mod rocket called Bismuth-Class Rescue Drone SSTO: Labrador . Built with 75 of the finest parts, its root part is B9.Cockpit.S2.Body.Crew.6m. Bill and Bob sat down with the engineers of the KKAC and worked to design this next craft. After Val and Jeb managed to get their last test craft stranded in orbit, the two Kerbonauts decided they’d finally had enough, and devised an SSTO that could be launched from the KSC and quickly get into orbit to retrieve up to 12 Kerbals and return safely to Kerbin. Named for something that Jeb came up with during one of his daydreams, the Labrador crew retriever has two Globe-X solid rocket boosters providing massively increased thrust at launch, and the current record-to-orbit stands at five minutes. Can any of our clients get it to orbit faster? Test it today for √79,000! Flight profile: The Labrador is likely the most difficult SSTO to fly to-date. With tight fuel margins and an overpowered SABRE-M engine forcing the craft through the atmosphere, thermal heating is a very important commodity to monitor throughout the entire flight. 1) Activate the SABRE-M engine and wait for it to spool up before declamping from the launchpad and activating SRBs. 2) Pitch over to about 30 degrees and gain speed until your SRBs are depleted and your velocity is around 600-700 m/s. 3) Decrease your throttle to around 1/6, or just enough to keep accelerating but keep your thermal heating down to a minumum while you pass through the atmosphere. 4) Once your heating begins to drop off (around 16,000/18,000m), throttle back up and increase speed until your engine becomes starved for oxygen, then switch to closed-cycle mode and circularize. Important note: Save your fuel! Use RCS as much as possible for orbital maneuvers, as once you’ve completed re-entry you will need to slow down to safe velocities to deploy your parachutes.